Sonoma Wine Country, Beautiful And Diverse! The Sonoma wine country is a beautiful and diverse area. Its large size, Sonoma County being about the size of the state of Rhode Island, guarantees that you will find a variety of activities that will keep you on the go. This is not place that you will see on a one day wine vacation. It is best if you have several days to explore. Sonoma County is quite different from its next door neighbor, Napa Valley. Where Napa is small, Sonoma is much larger. Where Napa is wall to wall wineries, so its seems; Sonoma's wineries are spread out and fewer in number. Where Napa's geography is relatively consistent, Sonoma's is very diverse. Here you will find valleys, rivers, redwood forests, and is located at a stone's throw from ocean. 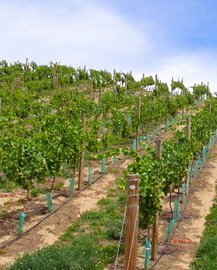 One thing that both areas share, besides miles of vineyards, is the Carneros region, located in both areas. Sonoma's wine history starts with its Mission. It was established in 1823 by Franciscan friars, the mission was formally dedicated in 1824. It was at this time that the first vines were planted. From those humble beginnings the mighty wine industry of today was born. The Sonoma Wine Country is large and consists of several distinct regions. Approaching from the south you will first encounter the Sonoma Valley. It served as inspiration for the famous writer Jack London's novel "Valley of the Moon". In this area you find the towns of Sonoma, Petaluma, Glen Ellen; as well as the County Seat, Santa Rosa, where you can visit the Charles M. Schulz Museum and Research Center. If you are a fan of Charlie Brown, Snoopy, Linus, Lucy, and Pigpen, this place is a must. Sonoma Valley wineries include Sebastiani Vineyards and Winery, Gloria Ferrer Champagne Caves, and the Robledo Family Winery. This winery was established by Reynaldo Robledo, who began his career at the age of 16 as a migrant worker from Mexico. He started out pruning vines and fell in-love with the grapes. To the northwest of Santa Rosa you come to the Russian River region. Here you will find the Roshambo Winery with its fabulous design, you can try some sparkling wine at Iron Horse Ranch and Vineyards in Sebastopol, or have a glass of Pinot Noir at Marimar Estates. You can also be awed by the redwoods at Armostrong Redwoods State Reserve, or try your hand at kayaking on the Russian River. The Dry Creek area and the towns of Healdsburg and Geyserville are strictly know for their wineries. The once huge, now more focused, Seghesio Family Vineyads, there you can try a Zinfandel. If you are in the mood for white wine, try Quivira Vineyards' Sauvignon Blanc. A bit to the north east you will find the Alexander Valley, the region that Kendall-Jackson Winery calls home. The Sonoma Wine Country is a special place that has inspired writers and explorers. It will delight you, particularly during harvest time. You will surely love this area.